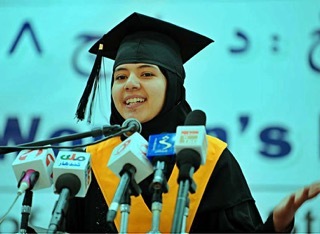 Nargis Ehsan is a 17 year-old girl who has dedicated her life to the education of women and girls in Afghanistan. She has been involved in connecting students in Kandahar with teachers from different parts of the world through the internet. She has been working to become an example and an inspiration for the girls in Afghanistan so that they can also work towards achieving their dreams. Ji Soo Ahn, one of our volunteers, sat down with her to discuss her work with KIMS, AIWR and Pax Populi, and their hopes and challenges in the rapidly changing political atmosphere of Afghanistan. I am 17. I live with my two sisters, two brothers, my mum and my dad. There are seven people in my family. I have dedicated my life to the cause of education, and helping women in Kandahar towards becoming educated. I graduated from my high school this year. I successfully made my way through a scholarship to the American University of Afghanistan in Kabul. I will be studying Bachelor in Business Administration (BBA) there. I also finished English and Computer skills at Kandahar Institute of Modern studies (KIMS from here). But I am still studying Business Management studies online from SAIT Polytechnic in Canada. I have worked as English instructor at KIMS and as a coordinator for Alliance for International Women’s Rights (AIWR from here) and Pax Populi. The one of the most interesting things about AIW and Pax populi is getting to know the people from different cultures, which is my hobby. I really love meeting new people from all around the world. I can say that I am a risk-taking girl. I love taking risks. In the conservative area like Kandahar, you have to take risks in order to get education. You are very passionate about the education. Who and/or what inspired you towards this path? My dad is the director of KIMS. He has been working for educating Afghan women in Kandahar since 2002. But he was also working for education even when we were in Pakistan; he had an institute and was educating the girls there. He has been working for educating women for a long time and he is still training more than 1500 women at KIMS. He is my biggest inspiration towards getting 'addicted' to education. Also it is hard for women to get education in Kandahar and in Afghanistan in general. After watching most of families not letting their girls get education and these women’s situation, their lives motivated me towards the education because I have this chance so I have to use it. I want to be an example and an inspiration for those other families who do not let their daughters get education. I want to be an inspiration so that their parents can watch me and other many girls who are getting education, so that they can watch us and they also let their daughters let their dreams come true. You work as a coordinator for both AIWR and Pax Populi. Could you tell us a little bit about each organisation and your work there? AIWR’s mission is to support women leaders and future women leaders in developing countries, with their current focus on Afghanistan. The important aspect of AIW is that creating the relationships between people of different cultures can help improve international understanding. I work as a coordinator for AIWR , introducing young Kandahari women to the teachers online from around the world. I help them arrange their classes, exchange the emails, organise their times and days and prepare for the classes. We have, since I have been working with AIWR, trained more than hundreds of Kandahari women, with the help of foreign volunteers. Now they are working in the organisations. At Pax Populi, its mission is to build peace through education. They have classes from foreigners. They teach the students. We are building peace through education and through these online classes. At Pax Populi I have the same duties; I connect the foreigner teachers with students here online. You are still a student yourself. And you have worked with many women to get their education. What are the challenges that women face when they get education? There are many reasons that stop Afghan women from getting their education. These challenges are based on how conservative most of the provinces are. For example, you will see fewer problems in Kabul, which is the capital of Afghanistan than in other conservative areas such as Kandahar, Helmand and many others. But the common challenges that these women face is the cultural problems, that people create. People create and reinforce a mindset that discourages women from seeking education, a mindset which has no real basis in the Islamic books. And the other problem is the early marriages; most of the girls get married before they get the education or before finishing their education. Most common problem, I can tell you, is that girls get abused by the thugs on the streets. While they are on their way to schools, they listen to so many bad words, which mentally kill them. The thugs on the streets warned them and threaten them because they are getting education and they are women. These are the common problems that girls face. You have to abide by all these conditions, which I have done. Even I have gone through so many, even still now when going to the university, I listen to so many bad words. And what I do is that I just put on my headphones in the ears, play a song and walk like a boss. That is how you can become successful in Afghanistan. If you listen to people, you will kill yourself. You will have to kill yourself if you listen to these people and what they think about you. Because in their minds, women are nothing. That is terrible. How do girls cope in this situation? Was there any girl who gave up their education to avoid this? I know a girl. I don't know her abusers but they threw acid in her face, while she was coming to the institute. They threw acid in her face, because she was getting education and her face was all burnt. No one could think that she would survive. But as soon as she recovered I saw her again at the institute, still getting education. People have now learned that giving up is not the solution. They have learned how to be confident when facing these problems. How did KIMS affect your life? What about the communities? If I didn't study at KIMS, I wouldn't be able to make my way to the American university of Afghanistan. It is the same for so many other girls. We have so many students in Kabul; they made our way to the university. Of course it change my life. It made me capable. The studies at the institute made me capable of how to communicate with the online teachers from around the world, who help the students here to fulfil their important aspect of their life. Also it helped me with my business management studies. It really helped me choose my future. One of the most difficult decisions I needed to make is what I will study in the future. My business studies made me entrust in studying Bachelor in Business Administration (BBA) that is what I am going to do. Overall it helped me become who I am today. I also became a big inspiration for many girls at the institute. The girls who get education at KIMS, they are the biggest inspiration to the families so that they can also let their daughters to get education. I started university and I am still working for the institute from Kabul. When I left I asked a friend who belongs to the conservative family if she can do my job now that I am leaving. She talked with her family and her family said that seeing me working as a coordinator and interacting with people from all around the world was inspiration so you can also be, you can definitely go and work. It was really great to hear that. There is news about the withdrawal of the US troops from Afghanistan and how it might affect the funding for the school. Could you describe the current situation of KIMS due to this? The US was great help to Afghanistan and to the people of Afghanistan. But unfortunately, when they invested money in the past, about 80% of the aid money was wasted. Most organisations and individuals who took on the projects; they wasted this aide money on lavish salaries, luxury cars, and properties. KIMS and the organisations like KIMS were starved of funding. I think the withdrawal of the US troops is affecting my work as a teacher at KIMS already. As the money started to decrease, our institute suffered. The classes were dismissed due to no funding. It is just a matter of time before our institute closes its doors, which will lead to the unemployment of 100s staff members of KIMS including me. I can say more than 1500 students will be left out of their studies due to no funding. That is too much. I can tell that Afghanistan still needs the help of US and international communities to support us. You know KIMS is and was a hope for 1000s of women. It still is a hope for 1000s of women at Kandahar where they could see their dreams come true and where they thought that they have future. So if there is no funding or no support from US, I am sure all these hopes and dreams, they would die. I can say overall Afghanistan still will be in situation from the past when women were sitting beside the closed doors at their homes because institute has no funding. This is the problem that will occur, which has already occurred. After I do my BBA, I really love education. I want to study many fields. I would like to continue my studies to master and PhD. But beside that, I would love to assume a leadership position and would love to have a big role in making this country a beautiful place. I want to raise the economy of Afghanistan through my business study. I want to improve Afghanistan; I want to have a good relationship with the world through economy.